Hypertension, or high blood pressure, is one of the most common disorders affecting the heart and blood vessels. About one in four Australians over the age of 25 years has this condition. It is often referred to as the 'silent killer' because there are, quite often, no warning signs. 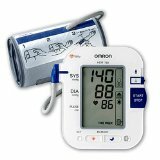 The Heart Foundation recommends that all adults know their own blood pressure level and what it means for their health. You can't tell if you have high blood pressure without measuring it so it's a good idea to equip yourself with an 'easy to operate' automatic blood pressure monitor. They are not expensive and you'll know just how you are doing and be able to adjust your lifestyle accordingly. Just click on the image to find out more about available monitors. If it is not controlled, hypertension can overload the heart and blood vessels and speed up the artery-clogging process known as atherosclerosis. This can lead to heart attack, stroke, heart failure and kidney failure which makes it one of the main risk factors for heart attack. The following 'risk factors' for heart disease are characteristics that increase your chance of developing heart disease. Blood, containing nutrients and oxygen, is pumped to all parts of the body, returning to the heart through a system of 'pipes' - the blood vessels. As well as pumping blood, the heart continuously collects 'used' blood from the body, sends it to the lungs for more oxygen, then pumps the oxygen-rich blood back out again. There are two kinds of blood vessels - arteries and veins. Arteries deliver blood from the heart to the body and the veins carry the blood back to the heart. Blood pressure is the pressure of the blood in your arteries as it is pumped around the body by the heart. Arteries are strong and elastic which allows them to withstand the pressure of the blood as it is pumped through their channels. They branch out into smaller arteries which have special muscles in their walls, and these have an important role to play in determining blood pressure. The entire system of the heart, blood vessels and blood is known as the circulation, or circulatory system. As the heart pumps, the flow of blood in the arteries, and the blood pressure, rises and falls in a regular ‘wave’ pattern. Blood pressure peaks when the heart pumps - called systole and falls when the heart relaxes - called diastole. Blood pressure varies from moment to moment, as it is affected by many different factors. In fact, if you monitor your blood pressure regularly, you will be lucky to hit on the same measurement twice. It is usually lowest when we sleep and gets higher if we are stressed or exercising. There is no 'ideal' reading, however it is considered 'normal' to have a 'systolic' reading of less than 120, over a 'diastolic' reading of less than 80. High blood pressure is more common in older people and persistently high blood pressure (140+ over 90+)(known as hypertension) should be treated appropriately. Blood pressure depends on two main things - the amount of blood pumped by the heart and how easily the blood can flow through the thousands of small branch arteries. Muscles in the walls of these small arteries are important in controlling blood pressure. When these muscles contract, the artery tenses and the channel inside becomes narrower. When it relaxes, the channel opens out. The narrower the channel, the harder it is for the blood to flow through and the higher the blood pressure. It is like the pressure build up that occurs in a garden hose when shutting the nozzle. So - it is important to treat your high blood pressure, whether you use the standard medical 'cures', which artificially keep your blood pressure lower than it would be without the drugs, or use more natural methods to keep your blood pressure under control. One natural High Blood Pressure Remedy which you may like to consider is Levodyn which is composed of natural herbs that help you lower your blood pressure and thus increase your heart-healthy lifestyle. Personally, I always prefer to go down the natural path where possible, but do keep in touch with your Doctor and act on his/her advice. If you have been following these suggestions, chances are you won't have a problem. If, however, you do have a problem and if diet, exercise and other lifestyle changes aren't enough to reverse high blood pressure, then Doctors have a variety of drugs to try. I won't go into all the various drugs that are commonly used to treat blood pressure but suffice to say that medication will not cure high blood pressure. It will control its level, but only with continued use of the medication. Bear in mind that all drugs are toxic and have some undesirable side effects, so it is well worth making the effort to control your blood pressure by natural means. If you can regulate your blood pressure by making a few changes to your lifestyle and diet, wouldn't it be preferable to getting on the 'drug' treadmill? If your Doctor has prescribed a blood-pressure lowering drug or combination of drugs which you are taking, please do not stop taking them without consulting your Doctor. Talk with your Doctor about your desire to treat your blood pressure naturally so that you can, together, develop a plan of action. Lets go over, in more detail, the previously mentioned suggestions. The first thing you must consider is your weight. Not only will losing weight (if you are, in fact, overweight) improve the health of your heart, it will help your body to work better and reduce the risk of many of the diseases that we encounter today. A good way to determine if you are overweight, if you are not sure, is to measure your body mass index. A reading 25 - 29.9 is considered overweight and over 30 is obese. If that's where you are, then there is only one answer. You need to lose some weight - just losing one to two pounds a week will reap big rewards for you! A January 2003 analysis published in the Journal of the American Medical Association, revealed that obesity in your 20's can reduce your expected lifespan by as much as 22%. Smoking can have a very detrimental effect on your blood circulation, and your blood pressure. Because, as a smoker, your blood carries less oxygen and more plaque, so you are more likely to suffer dangerous blood clots and strokes, as well as back pain and blockages of the tiny blood vessels in the eyes, ears and other organs. This can lead to poor circulation in your hands, feet and limbs, which can cause severe pain, especially when exercising, and can result in gangrene and amputation. Regular physical activity makes your heart grow stronger, which means it can pump more blood with less effort. The less work your heart has to do, the less pressure that is exerted on your arteries. So, becoming more active could be enough to reduce the need for medication. If your blood pressure is at a reasonable level, exercise can keep it from rising. It will also help you to lose some weight which is another way to control blood pressure. Just be aware that you will need to keep it up - the benefits will last only while you continue to exercise. Flexibility and strengthening exercises are an important part of an overall fitness plan, but it takes aerobic activity to control high blood pressure. You won't need to spend hours in the gym every day to benefit. Simply adding moderate physical activities to your daily routine will help. Any physical activity that increases your heart and breathing rates is considered aerobic. Mowing the lawn, raking leaves or scrubbing the floor counts — as long as it takes effort. Other common forms of aerobic activity include climbing stairs, walking, jogging, cycling and swimming. Aim for at least 30 minutes of aerobic activity most days of the week. If you can't set aside that much time at once, remember that shorter bursts of activity count, too. Studies have found that blood pressure can be reduced with an eating plan that is low in salt, saturated fat, cholesterol and total fat, but includes more fruits, vegetables, whole grain products, fish, poultry and nuts. Avoid sweets, added sugars and sugar-containing beverages but add foods rich in potassium, magnesium and calcium as well as protein and fiber. Follow a low glycaemic diet and it will not only help you lose weight but will help keep your blood pressure at an acceptable level. Alcohol in moderation is fine for most people. There has been a lot of news lately singing the praises of wine for the healthy effect it can have on the body but too much alcohol can be bad news for people with high blood pressure. An acceptable amount for a woman is one drink a day while a man can have two, a drink being defined as 12 ounces of beer, five ounces of wine or one ounce of liquor. Click here to learn more about some of the foods you could add to your diet and what you should avoid, to help control your blood pressure. My thanks to Jon Barron and to the Heart Foundation for most of the above information. Disclaimer: The information provided on this website is intended for your consideration only and should not be regarded as a substitute for professional medical advice. My intention is to give you 'food for thought' and any recommendations I make are not intended to diagnose, treat, cure of prevent any illness. You should not use any information contained on this website to self-diagnose or treat any medical condition or disease and you should always speak with your own health care provider before taking any dietary, nutritional or herbal supplements.